Well, that was... not terrible? It really wasn't terrible at all. Not even a little bit. These days, that's what passes for a ringing endorsement of All-Star Weekend. After years of watching the event get progressively worse, with barely interested players floating through something that only vaguely resembled real hockey, expectations for the weekend could hardly have been lower. Anything better than "terrible" would have been considered a victory. Instead, we got something that was—dare I say it—actually good. Like, legitimately entertaining. I know, I'm as stunned as you are. Sunday's win by the Pacific Division, which earned a 1-0 victory over the Atlantic in the final of the new format's mini-tournament, closed the curtain on a weekend that mostly worked. With the NHL schedule on hold for the better part of a week, there's not much point in doing a new round of the regular weekly power rankings. So instead, let's borrow the format and apply it to All-Star Weekend, with a countdown of the five best and worst stories from the past few days in Nashville. The five highlights of NHL All-Star Weekend. This is, of course, completely ridiculous. Bettman's last major appearance in front of NHL fans was the draft in Florida, at which he was booed. More recently, he appeared at the Glen Sather ceremony in Edmonton, where he was booed, and at the Sharks' 25th anniversary celebration, where he was booed. I mean... this is a bit now, right? Bettman is winking at us, pretending to play along with the whole booing thing in an obviously fake and over-the-top way. The whole "the game is pretty good" quote—coming right in the midst an ongoing era of low-scoring, low-intensity hockey—is the giveaway. Bettman is messing with us. And, if so, here's hoping he really runs with it. The next time he's getting showered with boos at an NHL arena, he should make a big show of acting confused, making exaggerated "What's going on?" gestures while egging fans on. Maybe even grab a mic and ask everyone why they're chanting for this guy. Really steer into the skid. I'm telling you, it will be gold. Gary Bettman, comedic genius. Who knew? 4. Nashville: The All-Star Game doubles as an opportunity for the host city to show off a bit. 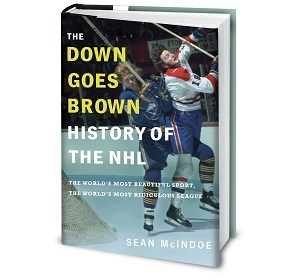 If you're a longstanding hockey hotbed, that means breaking out the history. If you're what we'd politely refer to as "non-traditional market" that means a chance to show you belong in front of a hockey world that's probably looking at you at least a little bit skeptically. Recent history has leaned heavily toward that latter group of hosts, with cities like Dallas, Raleigh and even Atlanta getting a turn in the spotlight. Last year was Columbus, and other than almost killing everyone in the press box with that ridiculous cannon, it did a fantastic job. That brings us to this year, and by all accounts, Nashville hit it out of the park. The city has always been known as one of the league's underrated fun destinations, and it embraced that reputation throughout the week. The game was surrounded with a mix of everything, from the predictable (lots of events for kids) to the clichéd (a little too much country music) to the bizarre (the, um, cheese fountain). The fan fair sounds like it was a hit. Heck, there was even a great crowd for that awkward red carpet the league insists on doing. Not everything worked—we'll get to that weird Friday night thing in a minute—but enough of it did that Nashville gets a solid thumbs up. And hockey fans got another reminder that you don't need 100 years of history in your back pocket to enjoy the game. Thought all your columns were going to be put on here as well as Vice Sports?